(Nanowerk News) Sandia National Laboratories scientists have developed tiny glitter-sized photovoltaic cells that could revolutionize the way solar energy is collected and used. The cells are fabricated using microelectronic and microelectromechanical systems (MEMS) techniques common to today's electronic foundries. "So they use 100 times less silicon to generate the same amount of electricity," said Okandan. "Since they are much smaller and have fewer mechanical deformations for a given environment than the conventional cells, they may also be more reliable over the long term." Another manufacturing convenience is that the cells, because they are only hundreds of micrometers in diameter, can be fabricated from commercial wafers of any size, including today's 300-millimeter (12-inch) diameter wafers and future 450-millimeter (18-inch) wafers. Further, if one cell proves defective in manufacture, the rest still can be harvested, while if a brick-sized unit goes bad, the entire wafer may be unusable. Also, brick-sized units fabricated larger than the conventional 6-inch-by-6-inch cross section to take advantage of larger wafer size would require thicker power lines to harvest the increased power, creating more cost and possibly shading the wafer. That problem does not exist with the small-cell approach and its individualized wiring. Other unique features are available because the cells are so small. "The shade tolerance of our units to overhead obstructions is better than conventional PV panels," said Nielson, "because portions of our units not in shade will keep sending out electricity where a partially shaded conventional panel may turn off entirely." A widely used commercial tool called a pick-and-place machine ? the current standard for the mass assembly of electronics ? can place up to 130,000 pieces of glitter per hour at electrical contact points preestablished on the substrate; the placement takes place at cooler temperatures. The cost is approximately one-tenth of a cent per piece with the number of cells per module determined by the level of optical concentration and the size of the die, likely to be in the 10,000 to 50,000 cell per square meter range. An alternate technology, still at the lab-bench stage, involves self-assembly of the parts at even lower costs. Solar concentrators ? 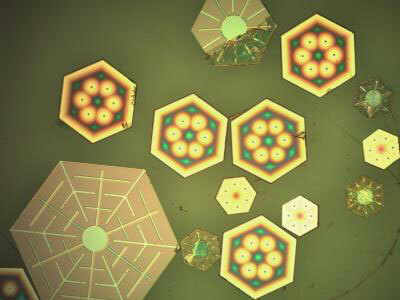 low-cost, prefabricated, optically efficient microlens arrays ? can be placed directly over each glitter-sized cell to increase the number of photons arriving to be converted via the photovoltaic effect into electrons. The small cell size means that cheaper and more efficient short focal length microlens arrays can be fabricated for this purpose.